I can remember many years ago having a conversation with a non-AS400 (yes, it was that long ago) person about the programming environment we worked with. He scoffed at the AS400 stating he could never work on it as it did not support Regular Expressions. I am not going to describe in too much detail what Regular Expressions, sometimes called regex or regexp, are as others have done a good job doing that. To give a very simple explanation: it is a sequence of characters that define a search pattern, which is then used to find or find and replace parts of strings. If you are interested in learning more check the Wikipedia page about regular expressions here. Within the Db2 for i PTFs that accompanied IBM i TR2 and 7.2 TR6 a number of regular expressions functions were introduced to SQL. I am not going to describe them all in one post, as it would be too long, as I feel they merit their own posts. To start this post is about the REGEXP_LIKE. I am just going to give a simple overview of how to use this, if you want more details or want to learn how to make complex statements I suggest you visit the page on IBM's KnowledgeCenter, link at the bottom of this post, or use your favorite search engine to search for "REGEXP_LIKE". The posts about REGEXP_LIKE for Oracle's PL/SQL I found helpful. Sometimes I find something that I think is cool, it may be something small, like this, but I feel it is worth sharing. I was asked about how to find the minimum value from multiple columns. SQL offers us the MIN function for returning the smallest value from a column. I can use that to get the smallest value from multiple columns, and the smallest value from all of those columns. Last week I found a wonderful article by Roger Pence in IBM Systems magazine. It started with the title "Your are not an impostor", and continued with the subheading "Self-taught RPG programmers bring valuable skills to enterprise programming teams". As one of those self-taught programmers it caught my eye, and he made some good points about what would make me feel like an impostor, and what I can do to overcome it. It confirmed my opinion that there is a place in every organization for the self-taught and motivated programmers, alongside the formally educated graduates. You can read the article on IBM Systems online magazine here. If, like me, that site does not always load, I have placed a copy here (PDF file). Alas, when I tried to go to the URL given for "The Impostor's Handbook: A primer for self-taught programmers", bit.ly/2ivK5lt, it went to a 404 page not found error page. If you have the correct URL for this page I would be grateful if you would post it in the comments section below. One of my colleagues was reading the post about initializing variables when defining them and asked a question that I had not considered when writing that post. "What if I change the value in the variable," he asked, "can I change it back to its original value?" Fortunately there is in RPG an operation code that will do this. The RESET operation resets the value of any variable or record format back to the value it was at the initialization phase of the program. It is not new operation, I have used it for as long as I have programmed on the AS400 - IBM i.
I have Steve Pitcher to thank for sharing this image so that I could post it here. 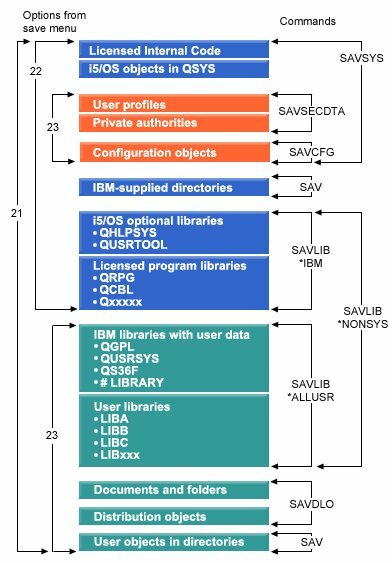 It is from IBM's KnowledgeCenter showing the different types of saves that can be performed using the various save commands, on the right side, and the options on the SAVE menu, on the left. Included in the latest Technical Refreshes for IBM i 7.3 and 7.2 is a SQL View and Procedure to help us monitor the licenses of the software on our IBM i.
IBM uses Software License Keys with certain IBM i products to ensure that I have paid the appropriate license fees to use these products on an IBM i. I know of several third party IBM i software vendors who also use this method to stop the unauthorized copying of their software to unlicensed servers. It is all standard stuff to prevent the distribution of unauthorized software.